A letter from Livia, our NEW CFM! Although I have not worked in a Church before, I come from a family with a strong Orthodox Christian tradition. My mother and her best friends were nursery teachers, so I am familiar with the atmosphere and working style of a kindergarten, where fun and joy must fill the air. After I finished High School, I studied Economic Sciences at the University where I spent the next 27 years of my life, as a student and then as an Economics professor. I dedicated my life to being a good teacher, and having happy students, with the right attitude towards education and professional training. Throughout my teaching positions I have always enjoyed duties which could be related to my creativity. 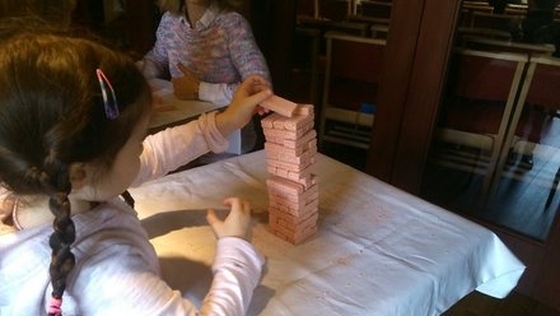 The activity that I preferred the most, no doubt, was seminars with team games, in which we tried to achieve motivation, to learn with the help of others, or even express thoughts, ideas and dreams through drawings. After my relocation to the UK in 2017, I didn’t seek to join academia again. I knew that I needed a change, in my career path as in my personal life. I started to ask myself what I would like to do most for the rest of my life. I remembered how fulfilled I felt while I was managing the interior design of my family home. So I knew I had to look for a professional career related to art and design, making art, or being involved in art related activities, like an independent artist or an organizer for art events. I then worked for a year as an Early Years Educator. In this capacity I most enjoyed working with children from the afterschool club, for which I organized and prepared a lot of creative activities. That’s the reason I see this position at St Peter’s Church as the perfect role to help me to express myself as a good teacher who loves to develop values, attitudes and positive behaviours towards inner confidence and faith, love, family and society; as a creative person who loves to create moments of joy for children; as an art student who learned to be true to herself, to grow in faith, and to follow her dreams. I remember how I felt the day when I was accepted as CFM – but Aung San Suu Kyi said it better than me in her first lecture for the BBC: “Speaking here has a very special meaning for me. It means that, once again, I am officially a free person”. If you’d like to know more about what we do at St Peter’s you can contact Livia at cfmstpeterschurch@gmail.com. (We now ask you to arrange for your child to come directly to the Hall after school). Please collect your child from St Peter’s at 5.30pm. On their first visit, we do ask you to complete a registration form for you to provide your contact details and any other information you wish to let us know, in particular any allergies your child may have. We serve pizza and drinks at around 5pm and there will be a tuck shop available if the children want to bring extra money. At present we are unable to collect additional children after their school clubs at 4.30pm as there aren't enough volunteers available to bring them over. However we are more than happy for children to join us if they can make their own way to us with/without your supervision. And finally we really need some volunteers to make this work please! Let us kow if you are interested or have a skill you can offer. Thank you! Any other questions or queries please message me, or email me on cfmstpeterschurch@gmail.com. 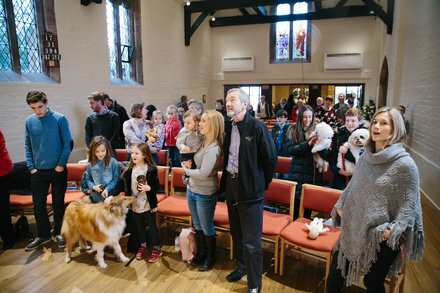 We had a wonderful Pet Blessing Service last year! There were 14 dogs, 2 cats, a guinea-pig and a few more beside (and some cuddly toys) as well as our friends the two Shetland ponies. On Palm Sunday the ponies were back again! We also enjoyed Mothering Sunday when the young folk, as tradition is, made little posies for their Mums and others! Every month we have our SWITCH service and there is always something for young people at our main services. Come and try them!